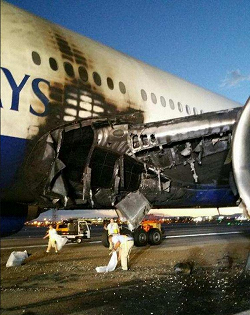 The Boeing 777 caught fire on the take-off runway after an engine failure resulting in serious fire damage. All on board were evacuated via emergency slides. The aircraft is a possible hull loss. 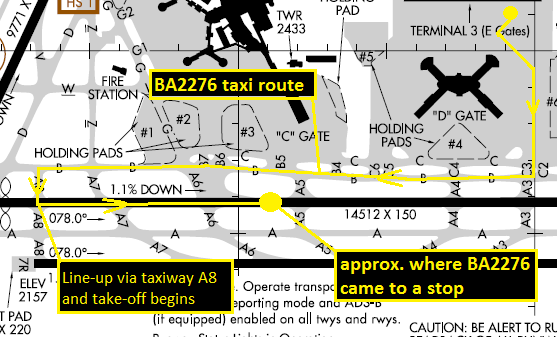 British Airways flight 2276 to London-Gatwick Airport was accelerating for take-off when an (uncontained) engine failure occured. 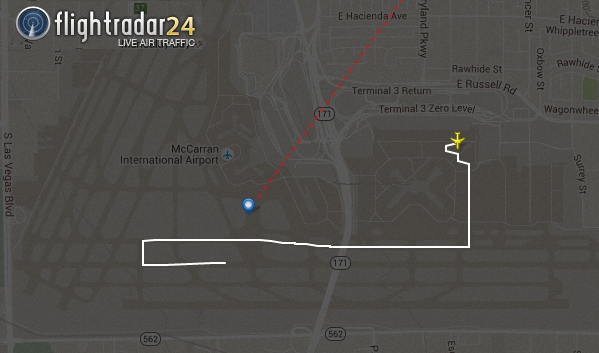 The pilots quickly aborted the take-off run and came to a stop approximately in the 1st 3rd of runway 07L(eft). 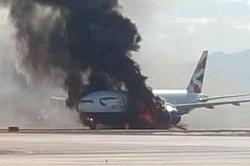 At that point flames and thick smoke was seen soming from engine #1 triggering an emergencxy evacuation of the aircraft. It is understood that all on board were able to escape with no or minor injuries. Fire truck arrived about a minute later and extinguished the flames. Initial post fire inspection showed large hole foreward of the left wingbox where flammable material may have been set ablaze. There is extensive structural fire damage to stringers and fuselage above that area. Despite the huge damage, it was decided to repair the aircraft again. On Feb 26 2016, the airaft made its first testflight and is going to be back in service soon. 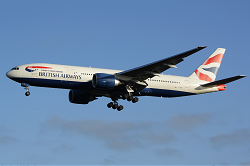 British Airways flight 2276, a Boeing 777-200ER, equipped with two GE90-85B engines, registration G-VIIO, was operating under the provisions of 14 Code of Federal Regulations (CFR) Part 129 and was enroute to London – Gatwick Airport (LGW), Horley, England. There were 157 passengers, including 1 lap child, and 13 crew members on board. There were several minor injuries as a result of the evacuation (mostly abrasions). The flight data recorder, cockpit voice recorder and quick access recorder have arrived at the NTSB Vehicle Recorder Laboratory and are currently being downloaded. On Tuesday evening, the airplane was photographed and the runway debris documented by FAA and airport officials before airplane was towed to secluded area of the airport (in order to reopen the runway). 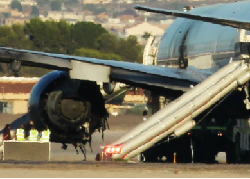 Initial examination of the airplane by NTSB revealed that the left engine and pylon, left fuselage structure and inboard left wing airplane were substantially damaged by the fire. This damage will be documented over the next several days. Investigators disassembled and documented the GE90 engine at the GE facility in Evandale, Ohio. 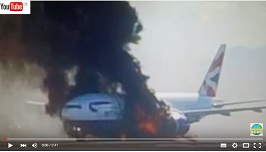 Group members from the FAA, GE, and Boeing, along with the United Kingdom’s accredited representative from the Air Accidents Investigation Branch and their technical advisor, British Airways, were in attendance. • Engine examination revealed that a portion of the stage 8-10 spool in the high-pressure compressor (HPC) section had failed, liberating fragments that breached the engine case and cowling. Additional pieces of the HPC spool were recovered from inside the engine and retained for metallurgical examination. • The NTSB Materials Laboratory examined engine parts gathered from the scene. • HPC parts recovered during the disassembly of the engine were examined at the GE facility. • All pieces of the damaged stage 8 disk rim have been collected. • The fracture initiated in the HPC stage 8 disk web, a part of the stage 8-10 spool. The NTSB will continue metallurgical evaluations of the disk and the fracture features. • GE is performing high-priority, focused inspections of HPC hardware from other GE90 engines. The inspection data is being gathered to support the investigation and to determine further investigative actions. airline´s 4th within 24 years. None of them was fatal.